Each electrical signal normally begins in a group of cells called the sinus node or sinoatrial (SA) node. As a signal spreads from the top of the heart to the bottom, it coordinates the timing of heart cell activity. First, the heart's two upper chambers, the atria, contract. This contraction pumps blood into the heart's two lower chambers, the ventricles. The ventricles then contract and pump blood to the rest of the body. The combined contraction of the atria and ventricles is a heartbeat. For more information about the heart's electrical system (including detailed animations), go to the Health Topics How the Heart Works article. A problem with any part of the heart's electrical system can cause an arrhythmia. Most arrhythmias are harmless, but some can be serious. ICDs use electrical pulses or shocks to treat life-threatening arrhythmias that occur in the ventricles (the heart's lower chambers). When ventricular arrhythmias occur, the heart can't pump blood well. You can pass out within seconds and die within minutes if not treated. To prevent death, the arrhythmia must be treated right away with an electric shock to the heart. This treatment is called defibrillation. Doctors also treat arrhythmias with another device called a pacemaker. An ICD is similar to a pacemaker, but has some differences. Pacemakers give off only low-energy electrical pulses. They're often used to treat less dangerous heart rhythms, such as those that occur in the upper chambers of your heart. Most new ICDs can act as both pacemakers and defibrillators. Who Needs an Implantable Cardioverter Defibrillator? Implantable cardioverter defibrillators (ICDs) are used in children, teens, and adults. Your doctor may recommend an ICD if you're at risk for certain types of arrhythmia. Doctors often recommend ICDs for people who have survived sudden cardiac arrest (SCA). They also may recommend them for people who have certain heart conditions that put them at high risk for SCA. For example, some people who have long QT syndrome, Brugada syndrome, or congenital heart disease may benefit from an ICD, even if they've never had ventricular arrhythmias before. Some people who have heart failure may need a CRT-D device. This device combines a type of pacemaker called a cardiac resynchronization therapy (CRT) device with a defibrillator. CRT-D devices help both ventricles work together. This allows them to do a better job of pumping blood out of the heart. Your doctor may recommend an ICD if he or she sees signs of a ventricular arrhythmia (or heart damage that would make one likely) on the following tests. Echo also can identify areas of poor blood flow to the heart, areas of heart muscle that aren't contracting normally, and injury to the heart muscle caused by poor blood flow. Your doctor uses the wire to electrically stimulate your heart. This allows him or her to see how your heart's electrical system responds. The electrical stimulation helps pinpoint where the heart's electrical system is damaged. Some heart problems are easier to diagnose when your heart is working hard and beating fast. During stress testing, you exercise to make your heart work hard and beat fast while heart tests, such as an EKG or echo, are done. If you can't exercise, you may be given medicine to raise your heart rate. How Does an Implantable Cardioverter Defibrillator Work? 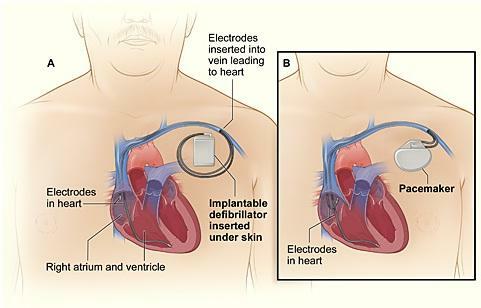 An implantable cardioverter defibrillator (ICD) has wires with electrodes on the ends that connect to one or more of your heart's chambers. These wires carry the electrical signals from your heart to a small computer in the ICD. The computer monitors your heart rhythm. If the ICD detects an irregular rhythm, it sends low-energy electrical pulses to prompt your heart to beat at a normal rate. If the low-energy pulses restore your heart's normal rhythm, you might avoid the high-energy pulses or shocks of the defibrillator (which can be painful). Single-chamber ICDs have a wire that goes to either the right atrium or right ventricle. The wire senses electrical activity and corrects faulty electrical signaling within that chamber. Dual-chamber ICDs have wires that go to both an atrium and a ventricle. These ICDs provide low-energy pulses to either or both chambers. Some dual-chamber ICDs have three wires. They go to an atrium and both ventricles. The wires on an ICD connect to a small metal box implanted in your chest or abdomen. The box contains a battery, pulse generator, and small computer. When the computer detects irregular heartbeats, it triggers the ICD's pulse generator to send electrical pulses. Wires carry these pulses to the heart. The ICD also can record the heart's electrical activity and heart rhythms. The recordings can help your doctor fine-tune the programming of your ICD so it works better to correct irregular heartbeats. The type of ICD you get is based on your heart's pumping abilities, structural defects, and the type of irregular heartbeats you've had. Your ICD will be programmed to respond to the type of arrhythmia you're most likely to have. Placing an implantable cardioverter defibrillator (ICD) requires minor surgery, which usually is done in a hospital. You'll be given medicine right before the surgery that will help you relax and might make you fall asleep. First, your doctor will thread the ICD wires through a vein to the correct place in your heart. An x-ray "movie" of the wires as they pass through your vein and into your heart will help your doctor place them. Once the wires are in place, your doctor will make a small cut into the skin of your chest or abdomen. He or she will then slip the ICD's small metal box through the cut and just under your skin. The box contains the battery, pulse generator, and computer. Once the ICD is in place, your doctor will test it. You'll be given medicine to help you sleep during this testing so you don't feel any electrical pulses. Then your doctor will sew up the cut. The entire surgery takes a few hours. You'll need to arrange for a ride home from the hospital because you won't be able to drive for at least a week while you recover from the surgery. What Are the Risks of Having an Implantable Cardioverter Defibrillator? Implantable cardioverter defibrillators (ICDs) can sometimes give electrical pulses or shocks that aren't needed. A damaged wire or a very fast heart rate due to extreme physical activity may trigger unnecessary pulses. These pulses also can occur if you forget to take your medicines. Children tend to be more physically active than adults. Thus, younger people who have ICDs are more likely to receive unnecessary pulses than older people. Pulses sent too often or at the wrong time can damage the heart or trigger an irregular, sometimes dangerous heartbeat. They also can be painful and upsetting. If needed, your doctor can reprogram your ICD or prescribe medicine so unnecessary pulses occur less often. People who have ICDs may be at higher risk for heart failure. Heart failure is a condition in which your heart can't pump enough blood to meet your body's needs. It's not clear whether an ICD increases the risk of heart failure, or whether heart failure is just more common in people who need ICDs. Although rare, an ICD may not work properly. This will prevent the device from correcting irregular heartbeats. If this happens, your doctor may be able to reprogram the device. If that doesn't work, you doctor might have to replace the ICD. The longer you have an ICD, the more likely it is that you'll have some of the related risks.